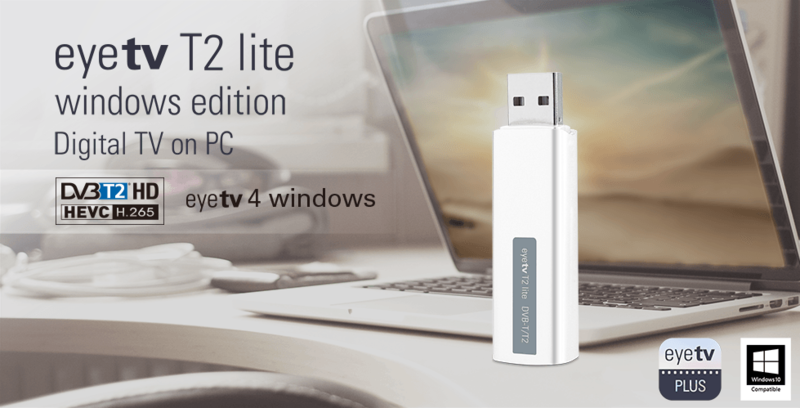 Watch, record, and enjoy TV on your PC with the brand new eyetv T2 lite Windows Edition. Superbly engineered and versatile, the eyetv T2 lite Windows Edition delivers free-to-view digital television to your PC via aerial DVB-T, DVB-T2 and DVB-T2 HEVC respectively. Connect the antenna - done! Enjoy Live-TV immediately thanks to quick and easy installation. Connect the TV Tuner with antenna to your PC in order receive a great variety of free-to-view TV programs that are broadcast over-the-air. eyetv T2 lite Windows Edition records digital HD TV in one quality setting, lossless. The digital stream is recorded unaltered for full quality digital content as encoded by the broadcaster. eyetv T2 lite Windows Edition also supports multilingual programming and Dolby® Digital sound. You can use eyetv T2 lite Windows Edition with a PC exclusively. eyetv T2 lite Windows Edition is compatible with Windows 10 or later and includes the eyetv 4 windows Software, which supports many of the same features as eyetv 3.